Nicole Sandoz and Victoria Williams of the Junior League of Pasadena, Inc. It's prom season! Organizations and community volunteers across the country are sponsoring prom dress drives to make sure that young ladies have an enjoyable and memorable evening, particularly for those who cannot afford to buy prom necessities. Read below about Victoria Williams and Nicole Sandoz, a dynamic pair of young ladies in California (and BlackGivesBack readers) who made this dream a reality for girls in Pasadena. 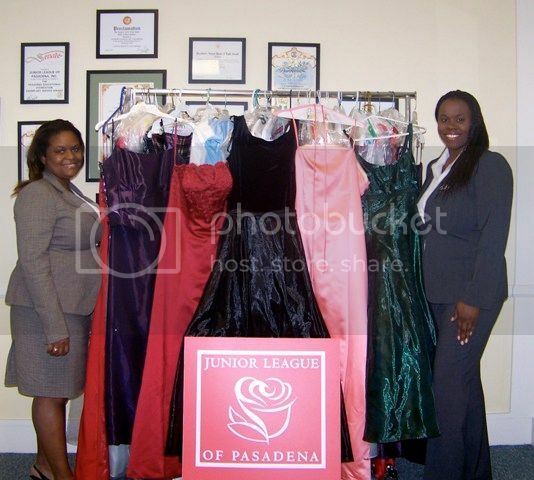 "The Junior League of Pasadena, Inc. (“JLP”) partnered with LA’s Prom Closet to host a Prom Dress Drive which began in February 2010. The Prom Dress Drive, organized by Victoria Williams and Nicole Sandoz, two members of the League’s Done in A Day Committee, was an exciting opportunity for the League to make a difference in the lives of local high school seniors. It usually costs anywhere between $200 to $500 for a girl to attend the prom – including a dress, shoes, hair, and tickets. Some students just can’t afford it. That’s where the Junior League of Pasadena, Inc. dress drive came in to breathe new life into dresses. The Junior League of Pasadena collected 55 lovely dresses from generous league members, local residents, and community members for distribution to LA’s Prom Closet. On March 27, 2010, 200 high school girls attended LA Prom Closet's annual “Dress to Remember” giveaway event in Los Angeles. At the event, girls scoured through racks of dresses bursting with colors from the rainbow, beads, and sequins. “Dress to Remember” was a joyful opportunity for the local ladies to feel there is a community supporting them and these young ladies will always remember the generosity of the people who cared." Great work ladies!